Thiel: Trust the Seahawks process? Well now . . .
Seahawks GM John Schneider asks everyone to “trust the process.” Except that the process in the past few years hasn’t produced talent worthy of trust. As he continues trying to change the tires on a moving car, John Schneider sounded a little defensive. Apparently the Seahawks general manager has heard of the bewilderment/dismay/contempt by some in the fan base over the big overhaul underway in Renton. He attempted to slow their roll Friday. In an interview on ESPN 710, Schneider fell back on a favored bromide of modern sports executives in charge of roster construction. “Trust the process, man,” he said. It was plain that Schneider was weary of those who say that letting go stalwarts such as CB Richard Sherman, DE Michael Bennett, TE Jimmy Graham and DT Sheldon Richardson, as well as role players such as Luke Willson and DeShawn Shead, for little or nothing in return, constitutes the definition of a rebuild. That’s the word GMs avoid like a martini of radioactive waste. “It’s a constant reset every single year, it doesn’t stop,” he said. “When I say ‘re-set,’ people are like, ‘Well it’s a rebuild.’ We’re not rebuilding; it’s just a re-set. “We’ve got some pretty good players on this football team. And there’s a lot of young players that people don’t necessarily – they haven’t heard their names yet. I remember going through this when we traded (in 2010) Josh Wilson, and Kelly Jennings and Marcus Trufant (who) were here. And nobody knew who Byron Maxwell, and Richard Sherman and Walter Thurmond were . . .
It’s true that the Seahawks have churned the roster before, to good result. It’s true that full judgments of the draft classes of 2016 and 2017 are premature. It’s true that Schneider is only half-done this off-season, given that the 2018 draft awaits. But it’s also true that the current whirlwind has been populated by proven, well-known talents for whom first-year equivalencies will be hard to find. It’s true that coach Pete Carroll insists the franchise compete annually for championships, with no plan for a year of backsliding. It’s true that multiple unplanned vacancies coupled with little room under the salary cap have the Seahawks in a bind. It’s also true that when Willson signed recently in free agency with the Lions, it exhausted Schneider’s 2013 draft class. That’s the class that should be producing numerous contributors at their apexes in their late 20s. That is why asking the public to trust “the process” is a little more difficult right now, because Schneider has lost some credibility in the draft. From the 2014 draft, the Seahawks have only C Justin Britt, and from 2015, DE Frank Clark and WR Tyler Lockett remain. The irony is Schneider has conducted over the past two seasons almost a personal re-draft of 2013’s first round, acquiring OL Luke Joeckel (second overall), DE Dion Jordan (third), LB/DE Barkevious Mingo (sixth), OL D.J. Fluker (11th) and Richardson (13th). Schneider clearly believes in second chances. After paying all the young talent that was part of two Super Bowls, free agency also has been under-productive for Seattle because so little room remained under the salary cap. So they have fallen victim to the scythe that NFL swings at successful teams: Parity through attrition. One other matter bears mentioning here. Most fans understand the football consequences to Seattle of the retirement by RB Marshawn Lynch. But it took Bennett on a Bill Simmons podcast March 20 to explain the psychological consequences. There wasn’t much for Schneider and Carroll to do about Lynch: They couldn’t control him because all the players loved him. Nor could they succeed at the highest level without him. The fact that the fraught relationship between Lynch and Carroll was as long and productive as it was, is a tribute to both men. It’s unlikely the Seahawks will get another talent and personality such as Lynch, so his impact will have to be made up elsewhere. How that happens is not yet clear, because as was said, Schneider is only halfway done with a single-season makeover. He did say they wanted to get back to the original formula. He was asked what that was. “Smart, tough, reliable, fast, physical football team that’s competing like it has never been seen before,” he said. “And it’s this ultimate standard that you’re constantly trying to reach. There’s no finish line. Like, how do you get there? What’s out there? An admirable aspiration. But “the process” in getting there requires a steady pipeline of successful talent acquisition. Not perfection, not a total absence of missteps like Percy Harvin and Malik McDowell. Just steadiness. The Seahawks have been unsteady for a few years. Public trust? That may have to be a re-set too. With Paul Richardson departing for Washington the club’s 2014 draft class is down to Justin Britt. Their 2015 class has only Frank Clark and Tyler Lockett still with the team. They still have 7 of 10 players remaining from the 2016 draft but released RB Alex Collins who finished last season with 973 rushing yards and 6 touchdowns after a 125 yards, 1 TD rookie season with the Hawks. If the process is to always compete and replace underachievers with free agents the team has done that before. After Super Bowl XL. Look how that worked out. Reminder: The draft hasn’t happened yet. The process broke down when Marshawn didn’t get the ball in the SB. It’s been unraveling ever since. I wait with bated breath. Contrary to what many experts say, I think Paul Allen has given the directive to clean up the locker room. It is not just wife beating that has tarnished the NFL brand. 2017 was Pete and John’s year to prove they could manage chaos. 2018 is the year for them to clean it up. Nothing I’ve heard, read or seen suggest the slightest bit of truth to your statement. …and yet Frank Clark remains. That theory doesn’t make sense. Stats of the time say the line probably couldn’t do what was necessary to get Lynch in. They had several shots. Pete called for a passing play and I don’t fault that because I don’t think he wanted Blevins to throw right at the teeth of the defense. Without the disaster Lynch would have gotten the ball for one of the shots. So Blevins will forever defined for that one call, as Ruskell will always be remembered as the sonofabitch that lost Hutch . . . I assume you’re talking about Bevell, unless you found a new villain for the Play That Cannot Be Unseen. I agree that nothing has unraveled. Time, money and injuries change things, and it’s hard to keep up. One team has held up longer, thanks mostly to the best player in the game’s history. Thank you for the correction, Blevins, Bevel, some days they just all run together . . . I disagree. The Seahawks’ world has not been the same since The Play. I think you can point to one play or one day as world changers. 12-7-41, 11-22-63, 9-11-01 and 3-17-09 come to mind. I’d be careful about analogizing between sports seasons and world history. All have turning points, but in the NFL, decay of successful teams is a built-in part of the system. If Lockette had scored, can it be said that the Seahawks decay wouldn’t have happened anyway? Good question. I’d say yes, but with less angst and urgency. I was a Raider fan for what seems like 30 years. Al Davis did a pretty good job of mixing badasses (Atkinson, Tatum) and nice guys (Villapiano, Banaszak). Then you had Snake Stabler and Stork Hendricks who could be mean and gutsy, whatever it took. Coach Madden and Coach Flores melded the talent and got three titles from 77 to 84. Hard to believe there’s a formula though. A lot of intuition and forethought. Marshawn was a great player but somewhere out there is a Marcus Allen that can get you the same result without the headaches. You’re right about the formula, there really isn’t one. But Bennett is right about the need in football for contrarian badasses. They’re hard to manage, especially in the roid-rage era of the Raiders’ peak, but they make winning teams. In all fairness, John didn’t say “Trust me”, but rather trust some nebulous process. Imagine the eye rolls if he did. I stated here a couple months ago we would rue the day that we didn’t allow the Packers to talk to John for their open GM position. As I wrote, Schneider is half-done. Betting lines in the off-season are as worthless as stars the recruiting services put on high school recruits. What if Schneider trades Wilson for the Browns’ first and fourth to take Darnold and Barkley? Wheeeeeee! Are the Browns that dumb? That would be like taking candy from a baby. The Browns could be that dumb, and the trade could involve other picks/players. As far as Schneider’s trades, the Lynch deal worked out OK. So did the trade a year ago w/Pats that brought Coleman, a nickel starter. Lynch trade was in 2010, a long time ago. And Coleman was an outlier. I would be OK with that but only if we do it this year; waiting until next year hurts our Cap and this year’s QB class is great time to take the risk, there are 2nd rounders this year that could run our offense, next years class is not worth it. So trade him in the next few weeks or be prepared to shell out 30 to 35 million next year to extend him. We don’t want to wait another year and pay him even more like the Ravens did. Don’t think of it as 30 million, think of it as 6 good starters or 2-3 superstars. A high cost to be sure for a run first team to spend on a QB. The Seahawks understand that if they were to seriously consider dealing Wilson, the moment is now, not after 2018. Don’t underestimate how the Cousins deal changed the NFL QB world. I say this over and over to my panicky friends. A team with a core of Russell Wilson, Bobby Wagner and Earl Thomas will be competitive if they can complement them with average talent. Then again, with the Rams having Suh and Donald on their D-Line, you probably want to get above average on the O-Line if you want to keep 1/3 of that core upright. Aside, all moves when trying to sustain greatness are compared to the Patriots, for obvious reasons, and the non-Tom Brady churn is relentless. What everyone forgets, is one of their greatest advantages has nothing to do with them. They’re in the most consistently bad division in football. The Seahawks don’t have that. The Rams are scary, and assuming Janeane Garofalo isn’t just benefiting from lack of game tape on him, so are the Niners. There’s actually a lot of film on Garofalo, but the only one I’ve seen is “Romy and Michele’s High School Reunion” in a back-up role. Heard about that. Jim Mora may be out of coaching, but his malady lingers on. I don’t think the issue is “competitive,” which can include 6-10 teams. Carroll says he wants championship level competition, which has worked until last season. But injuries have conspired with poor draft/FA results to force a lot of changes into one offseason. Not sure “the process” works that fast. True, but I take that rhetoric with a grain of salt. The T-Jack/Whitehurst two headed monster year was not a year of championship level competition, but it did lay the foundation for this run. Next year is probably going to be a bit like 2011. Whether or not they can all the sudden be contenders again in 2020 depends on whether or not Pete and John can draft guys that Pete didn’t recruit or play against in college, and the early returns are troubling. Pete’s personal history with a few guys was a little helpful, but hardly decisive. He recruited Percy Harvin in high school. Seahawks arrived in Seattle in 1976, went to their first Superbowl in 2006 (30 years of futility) and lost. 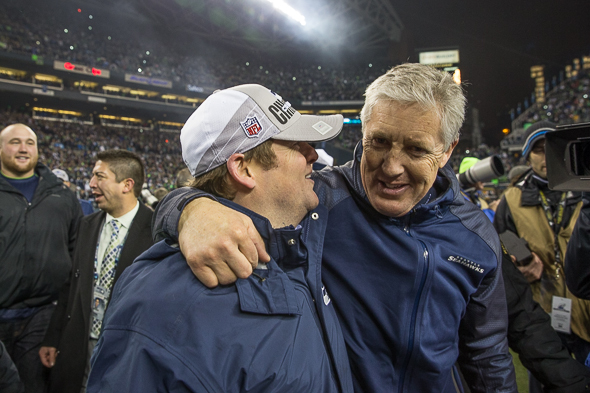 In 2010 the brought in Pete Carroll and John Schneider, 5 seasons later Seattle got to celebrate their first major sports championship in 37 years. IMO, the current regime deserves a couple of mulligans. Their first two seasons in Seattle, they were changing players more often than their underwear, everyone thought… “this is crazy BS, they have no idea what they want or where they’re headed”. Turns out it wasn’t so crazy. As a lifelong hawk fan, I’m willing to see where this is going. Given the current salary structure on the team (at least before the purge began), as Art points out, you cannot sustain what the ‘hawks had. The stars want and probably deserve to get paid. But 10 or so players eating 70%-80% of the salary cap, something has got to give. At some level, a player has to decide if they want to win as a team, or do they want to win at the bank. I don’t like Tom Brady at all, but you have to admit he probably deserves the top salary in the league, or at least top 3. He took less money so that the team could remain competitive. Given the beatings that Wilson is taking, his career won’t last nearly as long as Brady’s. It’s true that Schneider/Carroll have done far more right than wrong and deserve the time/respect to dig out of the current hole. But the draft/FA shortcomings are on them. Their top assistants and several of their top players can no longer be blamed. I’d like to hear more from them besides getting bigger, tougher, faster. I trust JS to rebuild the roster. While it is evident that his drafts of a couple years ago were poor it is a different draft mentality for those years. During 2013-16 we were really drafting for depth as we had few roster spots that a draftee would likely become a starter over the pro-bowl player who had been starting. For those drafts we were targeting few positions and were willing to take a risk to get a starter because it was unlikely to happen. Furthermore, it is hard to keep developing players on the roster who are raw when you have a pro-bowl starter at the position and a vet depth to add some competition for him behind him. Starting last year we really started drafting with the intention of filling those roles that had been locked up and I expect us to continue that this year. It is much easier to find a starter, and develop players, when you have playing time for them and more open roster spots. It is a different mentality, lets hope he is up to his “prove-it” year. Side note: I really wish we could get some honesty in GM comments about their intentions. Its not a crime to say “no comment” and certainly that is better than saying something untruthful or misleading. The deception has gotten so common that everyone expects the statements to be such and you can’t tell dreamers from the practical GM’s. Rebuild is not a dirty word and people know one when they see it anyhow. As I’ve said before, there’s little money in honesty. If a GM is honest about a player, he is said to have thrown him under the bus. The honesty you seek is a GM who says, yup, we blew that one. It would be nice, but very hard to do in an ultra-competitive game. It’s true that the young players who led to the two SBs blocked some development, but that doesn’t preclude finding quality replacements and grooming them to succeed. That’s what Schneider contends about Tedric Thompson and others. But there were no core players in the O-line or at some other positions that would have kept a top draftee from starting or playing a lot. Instead . . . Malik McDowell. Excellent insights and writing. Did Bennett make a case for Kaepernick? I don’t think Bennett’s player-personnel views about Kap were at all influential with the Seahawks. Just curious, perhaps you have insights Art, but were there indications that McDowell had maturity issues before the draft? Players like Sherman and Baldwin would lead one to believe that grit and character matter nearly as much as talent. Frank Clark appears to be a bit of a gamble that for now seems to have paid off. I just haven’t seen much on what was the early book on McDowell, and if the his pure physical talents made the Hawk’s brass myopic when it came to questions of character. At this point, it’s like the Hawks said to the rest of the league; “It’s alright, we’ll pass on our first round pick… we’re good”. Most scouting reports over two years had McDowell as a top-10 athletic talent, but problems with maturity and judgment were well known red flags that dropped him out of the first round. Definitely a higher-risk choice that backfired. stalwarts such as TE Jimmy Graham!!! Shame on you Art! I will never understand why they gave up on Willson – He was there 5 years and the lose him for a pittance. Only to replace him with a higher-priced DE they picked up in FAQ – why? Willson was a Hawk, through and through, and this guy, just like most of Schneider’s FA picks, will either be a one-and-done or IF he stays, will he be measurably any better than Willson? Willson was a cool guy, I liked him also. But the knock on him was inadequate blocking, and some critical dropped passes. Willson was a popular personality, but average or below in terms of receiving and blocking. Hardly terrible, but readily replaceable. And Graham was a three-year starter with numerous big plays/TDs. But not worth $10M. Seahawks are expected to have a whopping $79 million in salary cap space room in 2019. Third most in the NFL.